The University of Scranton will dedicate the new eight-story Edward R. Leahy Jr. Hall at a ceremony at 10 a.m. on Friday, Sept. 18, in the second floor Forum of the building. Planning the dedication are, front row, from left, Patricia Connolly, administrative assistant, Panuska College of Professional Studies; Debra Pellegrino, Ed.D., dean of the Panuska College of Professional Studies; Diane Muniz, office manager, Panuska College of Professional Studies; Meg Hambrose, director of corporate and foundation relations; and Trish Krisiak, director of stewardship and donor relations. Second row: Tara Seely, administrative assistant to the Board of Trustees; Frani Mancuso, director of conference and event services; Therese Aschenbrenner, director of catering; Lori Nidoh, director of marketing communications; James Devers, associate vice president of facilities and operations; Edward Steinmetz, senior vice president for finance and administration, Jason Wimmer, assistant director instructional technology; and Melissa D. Starace, associate vice president of annual fund, alumni relations and operations. The University of Scranton will dedicate Edward R. Leahy Jr. Hall, the new eight-story home of the Panuska College of Professional Studies departments of physical therapy, occupational therapy and exercise science, at a ceremony at 10 a.m. on Friday, Sept. 18. The 116,360-square-foot building on the corner of Linden Street and Jefferson Avenue will be named in honor of the late son of long-time University benefactors, Patricia and Edward Leahy ’68, H’01. Tours of the facility, which includes 25 state-of-the-art laboratories, nine traditional and active-learning classrooms, and multiple simulation environments, will immediately follow the dedication and continue until noon. The facility, which opened for classes on Aug. 24, is designed to facilitate research, expand service-learning projects, and put the best simulation environments, applied-science laboratories, equipment and technology directly in the hands of students and faculty. Most Rev. Joseph Bambera, D.D., Bishop of the Diocese of Scranton, will offer a blessing at the dedication, which will take place in the second floor Forum of the building. 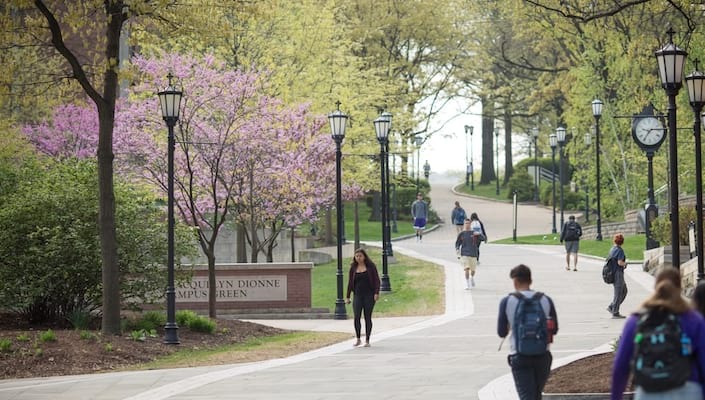 University of Scranton President Kevin P. Quinn, S.J., will speak at the dedication, as will Debra Pellegrino, Ed.D., dean of the Panuska College of Professional Studies, University Doctor of Physical Therapy (DPT) graduate student Shannon Gilman ’14, and Edward and Patricia Leahy. Also speaking at the dedication are Lawrence R. Lynch ’81, chair of the University’s Board of Trustees; Edward Steinmetz, senior vice president for finance and administration, and Donald R. Boomgaarden, Ph.D., provost and senior vice president for academic affairs. Officially the tallest building on the University’s campus at 130 feet, the facility is designed to accommodate the needs of the bachelor’s-, master’s- and doctoral-level programs utilizing the space and to encourage inter-professional collaboration. In addition, the facility creates unified entrance to McGurrin Hall, which houses the other departments of the Panuska College of Professional Studies (nursing, education, human resources, counseling and health administration) and the Leahy Community Health and Family Center. The dedication officially begins a yearlong series of events, entitled “Embracing the Call to Care,” which will give the greater Scranton community an opportunity to experience firsthand the facility and programs offered through the Panuska College of Professionals Studies.